Introducing the worlds first single and dual cooking electric range featuring second generation Flex Duo technology that offers the flexibility of two ovens in one. Big meals or small, full flexibility is now possible with a divider that turns this large cavity single oven into two ovens ready for a variety of occasions and demands. Its spacious 5.9 cu. ft. cavity and Dual Fan convection system provides consistent heat for cooking different dishes at the same time. The bright digital Twin Display touch control menu makes it quick and easy to control both ovens at a glance. The bridge burner provides more flexibility to your cooktop and enables cooking with oval shaped cookware and griddles. The warming drawer keeps cooked dishes at optimal temperature when served to your family. GE Free Standing Ranges can be installed free from surrounding cabinetrywhile the side panels have a finished appearance. The range features a Glass-Ceramic Cooktop and is made with a specially engineered ceramic glass that has an amazing resistance to both stains and impact. The heat comes from brightly glowing elements positioned beneath the smooth surface. Even heat is directed straight upwards to the pan for high speed heat transfer.Bake, roast, and cook evenly with GE's convection ranges. This extra spacious 5.9 cu. ft. oven easily accommodates a big roast, multiple casserole dishes or several racks of cookies. The 1-Fan system is great for baking and broiling because heat is distributed thoroughly and food cooks evenly, so you can enjoy tastier results each time. Whether you're boiling water, melting chocolate or simmering sauce, theres a burner for your needs. The Dual Fast Boil element helps you boil water quickly and saves you time when cooking. Plus, the smooth ceramic surface is super easy to clean. Choose Steam for a virtually odourless oven in 20 minutes, or choose self-cleaning for a deeper clean. This extra spacious 5.9 cu. ft. oven easily accommodates a big roast, multiple casserole dishes or several racks of cookies. The 1-Fan system is great for baking and broiling because heat is distributed thoroughly and food cooks evenly, so you can enjoy tastier results each time. Whether you're boiling water, melting chocolate or simmering sauce, there's a burner for your needs. The Dual Fast Boil element helps you boil water quickly and saves you time when cooking. Plus, the smooth ceramic surface is super easy to clean. Choose Steam for a virtually odourless oven in 20 minutes, or choose self-cleaning for a deeper clean. 30-inch 5.9 cu. ft. Free-Standing Electric Range with Flex Duo Oven in Stainless Steel Introducing the worlds first single and dual cooking electric range featuring second generation Flex Duo technology that offers the flexibility of two ovens in one. Big meals or small, full flexibility is now possible with a divider that turns this large cavity single oven into two ovens ready for a variety of occasions and demands. Its spacious 5.9 cu. ft. cavity and Dual Fan convection system provides consistent heat for cooking different dishes at the same time. The bright digital Twin Display touch control menu makes it quick and easy to control both ovens at a glance. The bridge burner provides more flexibility to your cooktop and enables cooking with oval shaped cookware and griddles. The warming drawer keeps cooked dishes at optimal temperature when served to your family. 30-inch 5.9 cu. ft. 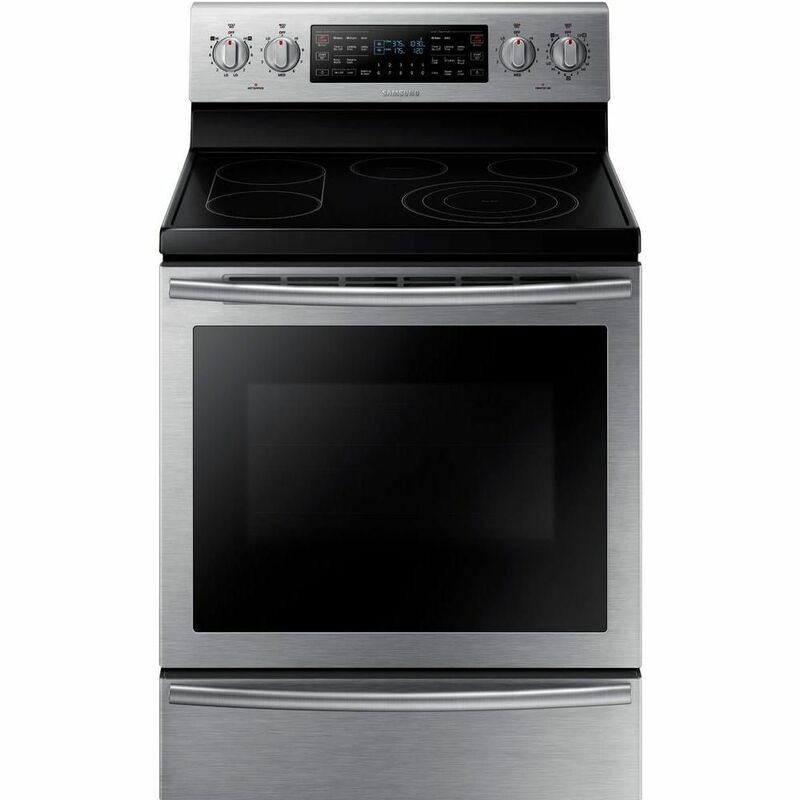 Free-Standing Electric Range with Flex Duo Oven in Stainless Steel is rated 2.3 out of 5 by 16. Rated 1 out of 5 by TorontoFoodie from Stay away Purchased in April 2018 and have been experiencing issues with proper heating temperatures. The Samsung service department is a joke. Overseas call centre with unhelpful service technicians. The local service techs ordered parts before even seeing the oven in person or understanding the problem of the product. Don’t purchase a Samsung range. I’ll be expecting a replacement from a better service provider. Rated 1 out of 5 by tina from Do not buy this product After buying this oven for 7 months, the indicator light broken. After getting if fixed, it broke again after 9 months. Strongly suggest do not buy this product. Rated 1 out of 5 by JIMA from Highly Unreliable Once locked and get repaired. Next Burner got replaced. Already have spent $600 in repairs in 3 years. Rated 1 out of 5 by tina from never buy this oven I bought this oven on Dec 28,2016. It's broken twice in less one and half years. Never buy this one. It's a disaster. Rated 1 out of 5 by NoraCharles from I am very sorry I bought this product. I have had it since Oct of 2015. When it was under warra... I am very sorry I bought this product. I have had it since Oct of 2015. When it was under warranty, I had a service person come out and try to fix the top oven door that would not open separately from the bottom drawer when the over was on. He said it could not be fixed. The oven temperature has never been correct. The oven cannot maintain the correct temperature. I have adjusted the temperature, and it still doesn't work correctly. I have never been able to fix a recipe in the correct time. I am on the second hour of cooking chicken that was supposed to cook in 35 minutes. What can I do? I am very disappointed after spending so much money on a product that doesn't work correctly. Rated 5 out of 5 by CANSUNG18 from Best Range for the money hands down My wife and i purchased this Stove a few years ago and could not be more pleased. The Flex Duo Oven is awesome! If you like to entertain often and present variety during suppers or have someone in the household who truly enjoys cooking or baking this will not disappoint. The only concern I have have had is the membrane display and controls. At this price and quality of product it should be glass touch, not membrane. the membrane can be difficult to clean if you are not vigilant about cleaning after every time you cook. Rated 2 out of 5 by Suzy from Oven temperature way off At first I really loved being able to use just half the oven to bake/broil my meals but then I started realizing that it was taking much longer to cook a meal than normal. I bought an oven thermometer and noticed it was about 40 deg F lower than what the temperature was set at. I recommend you use the convection feature for most cooking as this seems to work the best with the dual oven feature. This oven was a bit of a splurge for me and I am sorry I opted for it. Rated 3 out of 5 by MissCulture from Mixed feelings Love the stove with the option to use the top section only, both sections at the same time with different temperatures, or to use the full oven space. Never had a convection oven before and just love it, cooking is much faster and uniform....but I hate the stovetop! Impossible to clean and to keep clean, tried different products and still can`t get it to clean properly. Have known I wouldn`t bought it. Only had the oven for 2 months and looks like I had it for a few years already. It's a 15 amp breaker for the plug.